TasteCollectiv- Fresh Romesco and Pesto Sauces. Last Tuesday afternoon another lovely treat arrived from the BBC Good Food Show by courier. I was so excited to get samples of a brand new product that would be launching a few days later at the Good Food Show in Harrogate, which was a Pesto sauce and a Romesco sauce. Mark and Victoria will be launching these delicious sauces through their company TasteCollectiv. 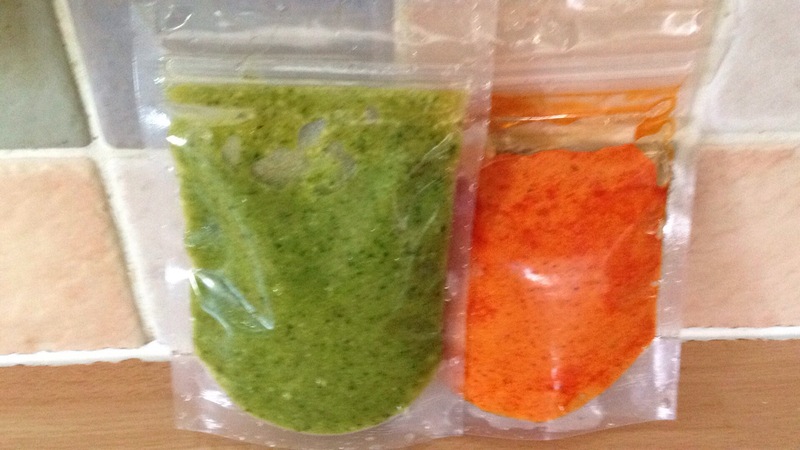 My lovely samples of fresh Pesto Sauce and Romesco Sauce from Taste Collectiv. I couldn’t wait to try them out on my family. It was going to be a real Mediterranean themed week for dinner in our house as that very night I had planned Spaghetti Bolognese. But what could I do with the sauces I was given? The Romesco sauce was the first we tried last Thursday night. Containing piquillo peppers, extra virgin olive oil, ground almonds, paprika, sherry vinegar, roasted tomatoes, roasted garlic and sea salt it was a perfect kick to add to any pasta or even to a chicken dish. I had not come across Romesco sauce before and found out that it originates from Catalonia. In my ignorance I thought it was Italian. I loved the sauce and will definitely be buying more of it. 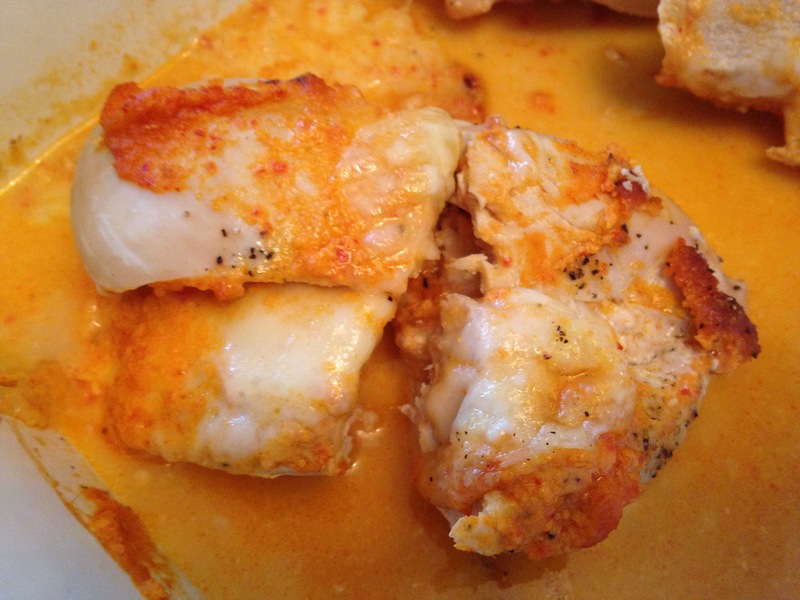 I chose to make some Romesco and Mozzarella Stuffed Chicken breasts. This is a recipe I make at home a lot but with pesto sauce as once you’ve stuffed the chicken it just cooks itself. Apart from the sauce getting a bit runny when mixed in with the meat juices and the cheese it tasted fantastic and went down well with Rosemary roasted new potatoes and salad. A teaspoonful of Romeso sauce and a slice of mozzarella went inside the chicken breast and then the rest went on top of it. It then went in the oven for about 30 minutes. 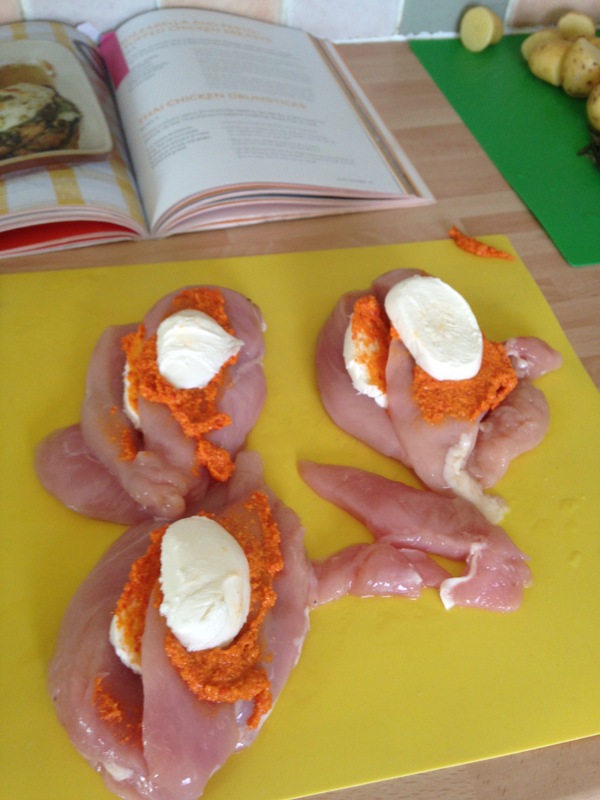 The finished Mozarella and Romesco Chicken. The sauce went a bit runny but it tasted fantastic. I used the Pesto Sauce last Saturday night in a recipe which is in Mary Berry’s latest book Foolproof Cooking. It’s called Express Bacon and Pesto Pasta, only I didn’t use bacon. I used chopped ham and instead of tomatoes, I chopped up two peppers. This was a fantastic way of using up storecupboard ingredients and tasted delicious. 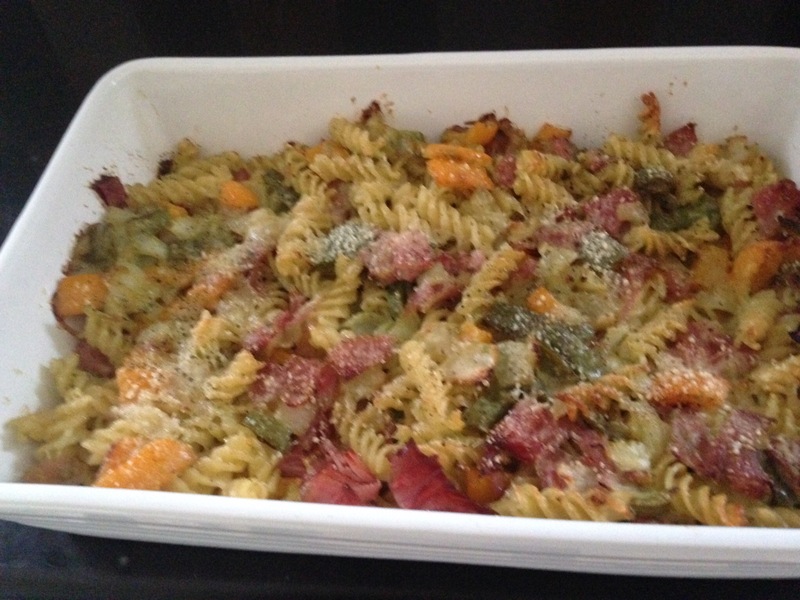 An adaptation of Mary Berry’s Bacon and Pesto Pasta, only mine had ham in it instead! The pesto was the best I had ever tasted and was packed full of Pecorino Sardo cheese, extra virgin olive oil, fresh basil, pine nuts, roasted garlic and sea salt. I’m looking forward to seeing more of TasteCollectiv in the future. TasteCollectiv’s bold and impressive packaging for their Romesco and Pesto sauces which were launched at the Good Food Show in Harrogate. I was given the samples to try for free. All opinions are my own. Previous Post The Bursary Award Winners at The Good Food Show Harrogate. Next Post Lemonade and Ginger Beer Drizzle Loaf Cakes- Fentiman’s Drinks.